I skipped July. I know. You all were waiting with bated breath, and here we are 2/3 of the way through August and I haven’t given you a list of glorious finds to lust after in MONTHS. What can I say? I’m doing the work of 3 people at my day job and that doesn’t leave much time for blogging. Plus I kind of like to see Jefe for 5 minutes before we literally collapse into bed every night from exhaustion. 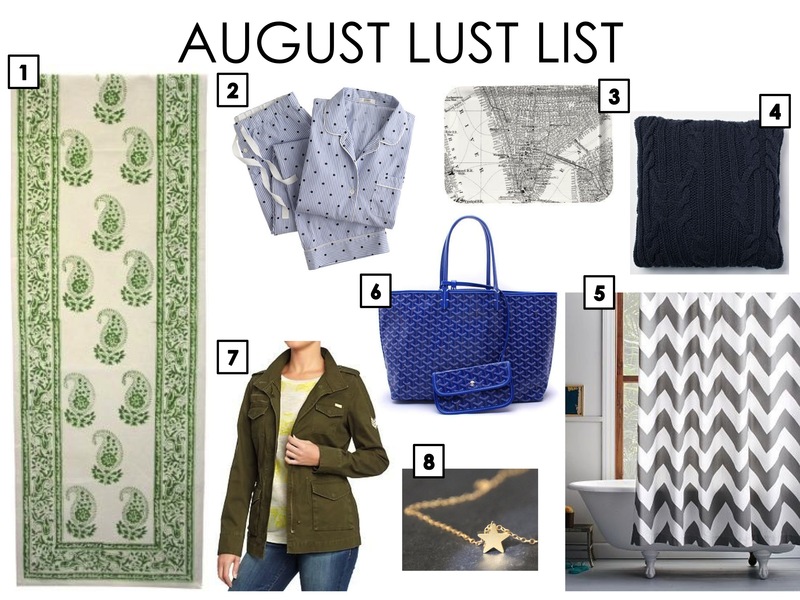 ANYWAYS, without further ado, I bring you August’s Lust List! 1) Pacific & Rose Table Runner: Last week I hit up the Rose Bowl Flea Market again and this stand is the first thing you see to the right when you walk in. Every time I go, I’m always drawn to the block-print textiles. They’re not *quite* Jefe’s style, but I’m obsessed with them nonetheless because they’re so beautiful. The patterns are very Pottery Barn meets India. Thinking I may have to snag a blue & yellow one for Momma Sny’s dining room. 2) JCrew PJ’s: I used to be the queen of pajamas back in high school and college. Remember Joe Boxer? Yeah, I was his #1 fan. But lately, my pajama drawer has been leaving much to be desired. After being introduced to Amber Interiors thanks to a “behind the blog” feature on Style Me Pretty Living, I was scrolling Amber’s blog and came across her post on Maison Du Soir. Although I can’t quite afford Maison’s prices, I’m loving the idea of wearing more than a battered t-shirt and some old sweatpants to bed. Besides, I really need something cute to wear while I’m watching Jefe cook me eggs on the weekend… what can I say? The man knows his way around a frying pan. 3) H&M Home Tray: It’s black, it’s white, and it’s New York all over. For these prices, I’ll take the set. H&M Home has quickly become my newest budget friendly obsession. If only it was a few inches slimmer, I’d have the perfect spot on my bathroom counter. 5) West Elm Zigzag Shower Curtain: Every since Jefe and I picked up this print and these photos, we’ve been wanting a little less modern feel. So while we were on the aforementioned West Elm trip picking up our cable knit pillow, we grabbed this puppy too. 7) Old Navy Zip-Front Military Jacket: I’ve been lusting after one for these for quite some time. Now they’re finally back in style and with a vengeance. Lucky for me, Old Navy has a bunch of them at a fabulous price. Perfect for those cool, desert nights in LA. 8) Gold Charm Necklace by Mei Elizabeth: Found this incredible jewelry stand at the Rose Bowl last weekend. The stand had a TON of beautiful gold necklaces. I had my eye on one just list this, except the charm was a wishbone. Had I $49 in cash on me, I’d be wearing it right now. And unfortunately she doesn’t have that particular charm on her Esty site. Guess I’ll have to go back next month with enough cash. Live and learn. So there you have it. This month’s Lust List. What have you all been lusting after? Any new home decor? Maybe a special piece of jewelry?